What if excellent customer service and great team working could be fun? How could that transform your workplace? Those are the questions behind the FISH! Philosophy. It’s a training programme designed around behaviours that came about spontaneously. And they did so in, of all places, a fish market. The FISH! 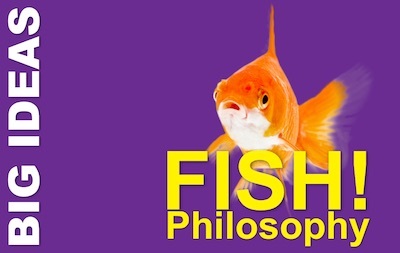 Philosophy is a trademarked training programme. So, in this article, we’ll tread lightly in describing its main ideas. If you want to know more, the place to visit is Charthouse Learning’s FISH! Philosophy website. Social Styles form a model of personality that focuses on our outer behaviour, rather than the inner you. Its founders described it as ‘the you that’s on display’. 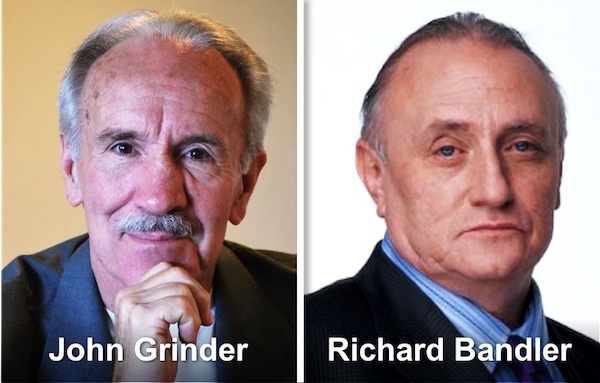 In the early 1960s, two industrial psychologists, David Merrill and Roger Reid wanted to understand whether they could predict managerial, leadership and sales performance. To do this, they explored how people behave in social situations. They chose not to concern themselves with why. Starting with BF Skinner’s ideas of behaviourism and James Taylor’s structured list of behavioural descriptions, Merrill and Reid discovered that people’s behaviour follows two continua, which they labelled: assertiveness and responsiveness. Assertiveness styles range from ‘asking’ behaviours to ‘telling’ behaviours, while our responsiveness varies from ’emoting’, or displaying our feelings, to ‘controlling’ our emotions. From these two dimensions, they defined four behavioural styles that we each display. As with other models, we each have our preferences, but can display all of the styles from time to time. The value of the model lies in using it to assess the people around you, and knowing how to get the best from people with each preference. Merrill and Reid labelled our ability to adapt to other people’s styles as ‘versatility’. 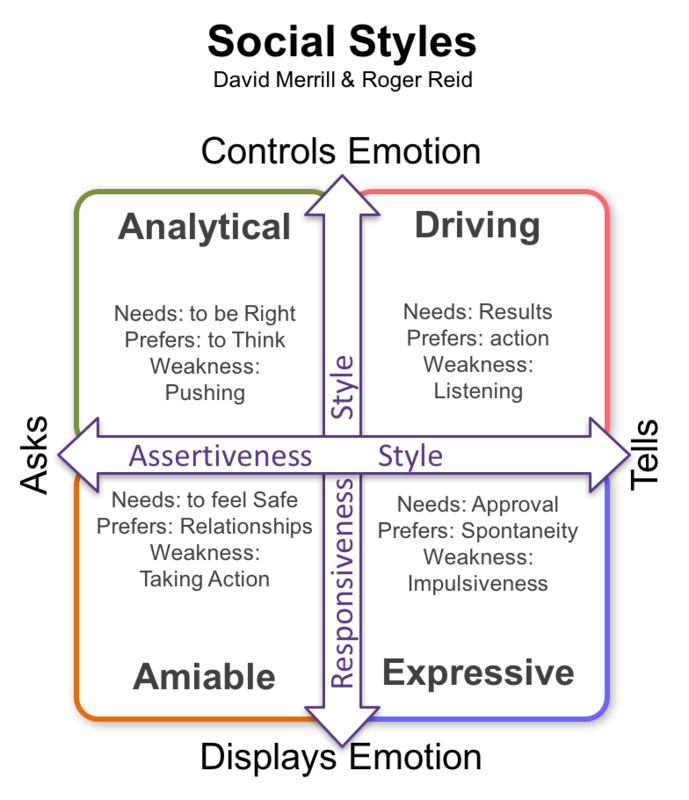 The four quadrants that the two dimensions of assertiveness and responsiveness create, give the four social styles. The analytical style of interaction asserts itself by asking, rather than telling. It is also characterised by a high level of emotional control. It values facts, logic and accuracy, presenting a disciplined and unemotional – some would say cold – face to the world. This manifests in a deep need to be right about things, and therefore a highly deliberative, data-driven approach to decisions. As with all styles, there is a weakness, which is a lack of willingness to state a position until the analytical person is certain of their ground. The driving style is the typical task-oriented behaviour that prefers to tell rather than ask and shows little concern for feelings. It cares more about results. This is a fast-paced style, keen to make decisions, take power, and exert control. Often unco-operative, this is an efficient, results-driven behaviour, the inevitable compromise of which is to sacrifice personal relationships in the short term and, in extremis, in the long term too. The weakness of this style is evident: a frequent unwillingness to listen and accommodate the needs of others. The expressive style is also assertive, but uses feelings to achieve its objectives. The behaviour is highly spontaneous and demands recognition and approval, and favours gut instinct in decision-making. At its best, this style comes across as charismatic, enthusiastic and idealistic. At its worst, however, the expressive style can be seen as impulsive, shallow and even manipulative. The amiable style expresses concern for people above all else. Keen to share emotion and not to assert itself over others, building and maintaining relationships dominate behaviour. These concerns manifest a slow, deliberate pace, coming across as sensitive, supportive and dependable. The corollary is a certain nervousness about, and even a resistance to, change. This arises from a deep need for personal security. The weaknesses of this style are the reverse of the strengths of the opposite quadrant: a low willingness to initiate change, and take action. Is this just another four box model? Well, yes and no. In its current form, the company that David Merrill formed, Tracom, uses the model with a third, fully-integrated dimension: versatility. 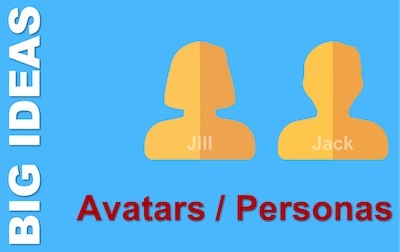 This is about how the four styles manifest in the real world, to meet other people’s needs. It is closely related to ideas of Emotional Intelligence. Even as ‘just another four box model’, it’s a good one. As a result, it has been widely emulated. A very similar model by Tony Alessandra uses the styles of Thinker, Director, Socialiser and Relater to replace Merrill and Reid’s four social styles, and dimensions of relationship and task orientation, to replace responsiveness and assertiveness. Both models have considerable power in helping managers understand their behaviours and those of other people around them. And by adapting their style, the models allow managers to get the best from any social situation. And work is, of course, if nothing else… social. Richard Branson went from academic under-performer to being the first serial entrepreneur to create eight $8 billion businesses (and many other successful ventures too). He is an adventurer, a risk taker, and a visionary. Above all, he is a business person who sees business as a means to an end or, in his case,many ends. But despite the galactic scale performance of his business mind, there are many lessons we can learn from him, that apply equally to the day-to-day business and management practices of Pocketblog readers. Many acres of newsprint (and Branson’s own autobiographies) have documented the life story of one of the world’s favourite entrepreneurs, so here it is in brief. 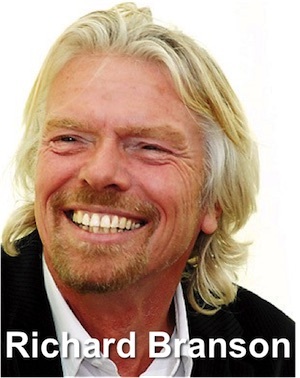 Richard Branson was born in 1950 in South London, to a comfortable professional middle-class family, which was able to send him to a privileged private school, Stowe. However, Branson was not academically strong, due to dyslexia, despite being evidently highly intelligent, so he left the education system at 16, only to return for a number of honourary degrees in later life. His first business, so named because he and his staff felt themselves to be business virgins, was a mail order business selling records below store prices, which he set up in 1970. This allowed him to enter the high street in 1972. In the same year, he created Manor Studios where his first recording artist was Mike Oldfield. The Tubular Bells album became (and continues, 30 years later, to be) a massive seller for the new Virgin Records label. Branson’s achievements span far more than his business ventures, but we’ll leave it to the glossy magazines to cover his record-breaking, kite-surfing, books, island buying and publicity-seeking activities, and simply list a selection from his business ventures. 1987 – Virgin Airship & Balloon Company. 2012 – Virgin Galactic announces the development of orbital space launch system LauncherOne. It is easy to look at a multi-billionnaire and say ‘of course he has fun; he is rich and can leave other people to run his businesses’. The fact is though, that Branson remains fully engaged with the strategic aspects of his business, and that he prioritises having fun and spending time with his family. There are plenty of comparably wealthy people who do neither. If he can make these choices, so can you. To make these choices, Branson is ruthlessly efficient at making lists and getting things done. He disparages those who write off To Do lists as a waste of time and is a compulsive note-taker and list maker. Branson’s ventures have often faced opposition from incumbent market leaders and sometimes political figures. Branson has deployed every form of response he can to fight off this contention and see his ventures succeed. His battles with British Airways (on behalf of Virgin Atlantic) and, more recently, with the UK Department of Transport (supporting Virgin Trains) are notable successes. Brand and public perception are a vital, and maybe central component of Branson’s business strategy. Very few of his ventures have eschewed the Virgin brand. Branson is a charismatic figure who has been adept at using his own personal brand to gain media attention, which of course has assisted in his public battles on behalf of his corporate brands. The central holding business of Virgin is tiny (much like Berkshire Hathaway’s) and there Branson leads, rather than bosses – recently setting highly innovative and permissive HR policies in place, which truly demonstrate exceptional levels of trust in his staff. When Virgin Atlantic won a legal case against British Airways and both he and the company received significant sums in compensation, he distributed this to the staff as a ‘BA Bonus’. Here is Richard Branson speaking at TED 2007. 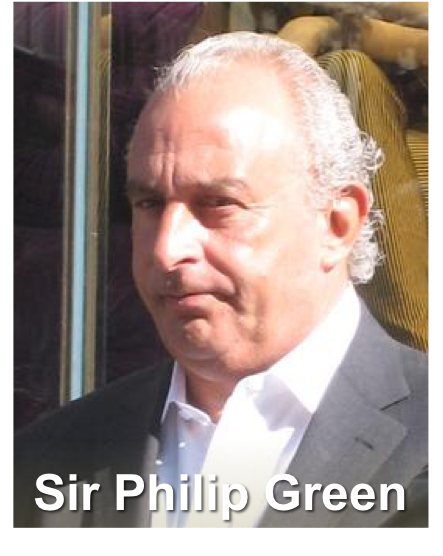 Sir Philip Green is rarely out of the news. 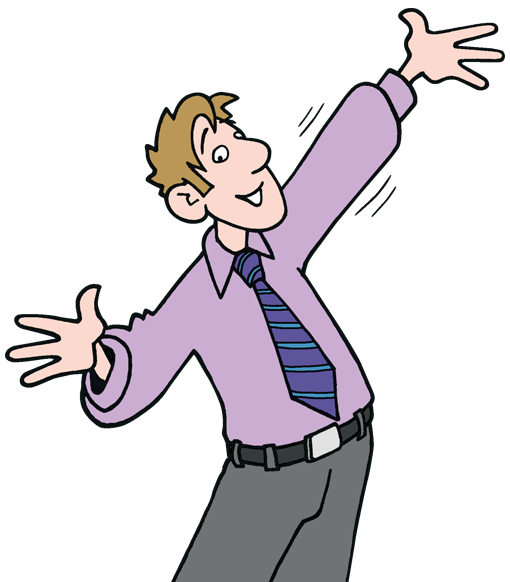 A self-made business man, he has long been a dominant figure in the UK retail scene and a figure with much to admire and much to criticise. When a TV audience is split 50:50 in loving and loathing a programme, it usually becomes a hit. On those grounds, Philip Green is a business hit! Philip Green was born in the Surrey (now South London) town of Croydon in 1952, where his parents were both involved in property and retail businesses. At the age of twelve, while at boarding school, his father died, leaving his mother to continue to run the family businesses – something she carried on into her eighties. Green, who had been used to earning money from a young age on the forecourt of the family’s petrol (gas in the US) station, left school as soon as he could, to enter the world of work. His endeavour allowed him to work his way up through all levels of a shoe importer, to discover a real talent for selling. When he left the company he travelled the world, learning practical lessons in business, which he brought back to the UK. Through the late 1970s and early 1980s, he became adept at deals involving buying stock nobody else wanted and selling it quickly. He operated primarily in the retail apparel market. He then turned this acumen towards buying and selling companies. His deals got larger and more profitable, his reputation for rapid deal-making grew, and so did his asset base. In 2000, Green acquired BHS – the former British Home Stores – which he rapidly transferred to his wife, Tina Green. He followed this acquisition in 2002 with the purchase of the Arcadia Group of fashion retail companies, that included some of the big names on the UK high street: Topshop, Burton, Wallis, Evans, Miss Selfridge and Dorothy Perkins. This was also transferred to his wife’s name. As a Monaco resident, the tax implications of this ownership structure have attracted much criticism in the UK. Already owning the second largest share of the UK clothes retail market, Green tried in 2004 to acquire Marks & Spencer – the largest clothes retailer. His bid failed with much vitriol between him and the then M&S boss Sir Stuart Rose. In 2006, Green was knighted for services to the retail industry. The 2010 general election saw him coming out strongly for the Conservative party – a move that was reciprocated by the new Conservative/Liberal coalition with his appointment to chair a review into Government procurement – of which he was highly critical. Perhaps Green’s largest business was BHS, so his business story is not one of total success. By 2012, the company’s fortunes were waning and in March 2015, Green sold the now loss-making business – debt free but with substantial pensions liabilities – for £1. As a multi-billionaire (with his wife), Green’s spending and tax affairs attract as much media attention as his business activities. He is famed for lavish parties (spending several million pounds at a time) and equally known for his charitable and philanthropic spending. Forbes rate the couple’s joint wealth in 2015 at US $5 billion. Whatever your view of him, Sir Philip has a talent for making decisions and turning a profit. Here are some lessons I draw from his experiences and choices. Green built his business on fast deals: rapidly doing the deal (often making a multi-million pound acquisition in days) and quickly turning that deal into a profit. Yes, Green is adept at risk taking, but taking risks is not a secret to success. Quickly assessing the risk and understanding your own capacity to handle it is what matters, and Green was a master – particularly during the 1980s and 90s. Green has a fiendish attention to every detail of his business, devoting much of his energy to driving efficiency into every last nook and cranny. Why did BHS fail, then? 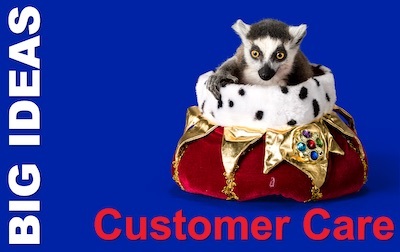 I wish I could ferret that one out, because his regal processes through his London Oxford Street empire of shops are well known within the business for ferreting out even tiny discrepancies in the selling process. Perhaps Green’s most closely held business belief is that shareholders drive the wrong decisions. Everything should be about giving your customers what they want, rather than pandering to shareholders. This is why he turned both BHS and Arcadia from publicly listed to privately owned companies. Maybe it is also why BHS failed for him: he could no longer figure out how to give customers what they want in a general purpose multi product store. It will be interesting to see if and how its new owners can square the circle that Green could not. Of course there are other things too, but most of them are what any manager would tell you are obvious ‘no-brainer’ habits; like: know your business inside out, respect and trust your people, keep working hard, stay alert for opportunities, and protect your supply chain. But the fact that Green does all of these does not make him different from many other successful business leaders. It’s the fact that he does them well and consistently, on top of the differentiators that make him exceptional. 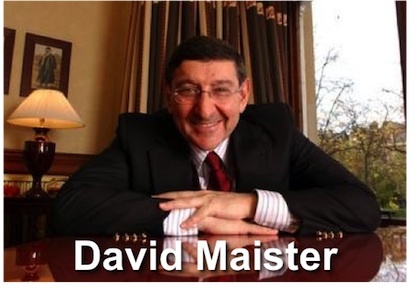 David Maister was described to me by a friend and colleague* as ‘the first good consultant’s consultant’. A former Harvard Business School professor, who hails from the United Kingdom, Maister carved out a niche as perhaps the most influential thinker about professional services and and the role of trust in business. David Maister was born in London, in 1947,and studied Maths, Economics, and Statistics at the University of Birmingham. He went on to achieve a Masters in operational research from the London School of Economics and a DBA from Harvard Business School, in 1976. He then taught, first at the University of British Columbia, and then, from 1979 to 1985, at Harvard Business School. During this time, he specialised in transportation and logistics. His books on the topic are now all out of print. He left academia to establish his own consultancy and started to focus on advising professional firms, like accountants, lawyers, marketers and consultants. This led to his keystone work, in 1993, ‘Managing the Professional Services Firm‘. This remains in print and a strong seller. Maister had found his niche. I came under his spell when given a copy of his 1993 book, ‘True Professionalism‘, while a manager at Deloitte. It was written for people like I was then: professional services managers, looking to build a career, a reputation, and a client portfolio. Perhaps Maister’s most influential book, however, was his 2000 book (co-written with Charles Green and Robert Galford), ‘The Trusted Advisor‘, which introduced us to ‘The Trust Equation’. His last book (to date) is ‘Strategy and the Fat Smoker: Doing What’s Obvious But Not Easy‘. The subtitle summarises the book’s thesis succinctly. At the start of 2010, Maister announced his retirement, shortly after being awarded the Carl S Sloane Award for Excellence in Management Consulting. He now spends his time in his home town of Boston, having forsworn air travel, enjoying the arts with his wife. How unusual and refreshing to see a top business person enjoying a fulfilling retirement. I’d like to summarise and interpret some of Maister’s ideas and how they link together by isolating five inter-connected themes, and showing how Maister joins them up. At the heart of ‘The Trusted Advisor’ is The Trust Equation, which Maister and his co-authors use to illustrate how the ‘four realms’ of trust interact, to answer questions like: ‘My client knows I am credible and reliable, so why doesn’t my client trust me?’. Trust (T), they argue is the result of four factors: Credibility (C), Reliability (R), Intimacy (I), and Self-orientation (S). But trust, they say, is not about knowing and it is not about tactics: it is all about attitudes and character. People will trust you if you show an interest in them, demonstrate a genuine desire to help them, and have a low self-orientation – that is, you are less interested in yourself than in them. Excellence, Maister says, arises from acting according to agreed principles and values, which also build trust (through reliability – or being predictable in your ethical choices). Here is the first link: A high trust business will experience high growth. Trust is the best business strategy. Maister observes that many professional services firms in the same market will often have near-identical strategies. So what will determine which one wins, competitively. Since they are all smart, it isn’t the choice of customers, products, services or marketing: it is the drive and commitment to implement the strategy effectively. And this comes from people and how the leaders of the business manage and lead them. Management is about people, passion and principle. Maister says that one-on-one management is the only real managerial activity, because this is the only way to properly engage with people. A manager’s agenda must be to create a great place to work, rather than working at building their own career: that will follow. Here is the third link: Management is about doing what’s right over the long term for your clients and people. This is the route to great client service. Maister sees the world of client services in a fairly simple way. But his work has been able to justify this with logic and evidence. A manager’s role is to energise their people. These people will then serve their clients excellently. 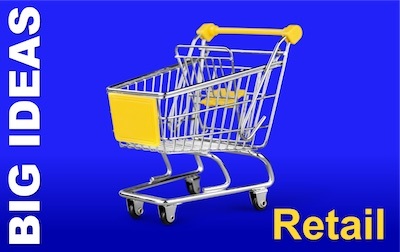 Clients will reward the company with their patronage and loyalty. This will lead to great financial performance. So stop focusing on the financial results – they are a lagging indicator of what matters: focus on energising your people. Maister notes that formal systems, policies and procedures do little to build a business: what it needs is managers to use their informal influence on employees, and demonstrate honour, character and integrity. Here is the final link, back to the start: Not compromising your values is the key to ‘values in action’. Without this, there can be no trust. * Michael Coleman, who sadly died in September 2011.